Out with the old | carpe diem! But not yet in with the new, although I’m knitting as fast as I can. 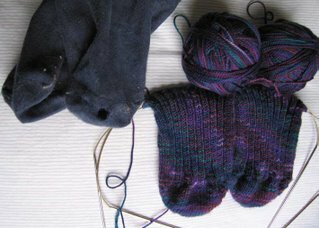 I’d been putting off knitting socks for A: his feet, although not immense, are much bigger than mine and I was intimidated by the thought of all those stitches. Also a bit worried that the reality (his first pair of hand-knit socks) wouldn’t live up to expectations, his or mine. He’s got arches so high I’m surprised he doesn’t have vertigo (he has orthotics to correct some of the problems they cause). After Mim’s explanation of toe-up gussets I’d begun to think I knew how to handle this, which is just as well. Late last week, as I was gleefully contemplating choosing between my Blue Heron Beaded Rayon and Piece of Beauty sock yarn, he came home from work, took his shoes off, and stood in front of the fire. “Please,” he said sadly, “may I have a pair of hand-knit socks?” And wiggled his big toe through a hole in the (boughten) pair he was wearing. So. Here we are, then. 72st on the needles (it would be more, but the instep’s on a 2.5mm needle), heading for c.8″ where I’ll start an extra-big gusset. 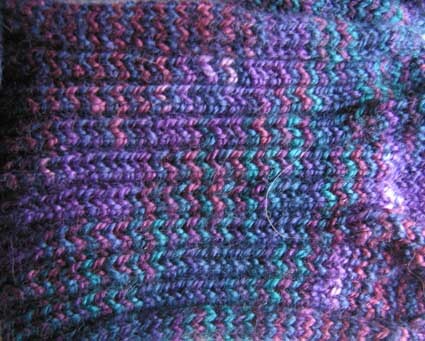 Turn the heel at 10.5″ and head on up the leg. I’d really like to finish them for Christmas, so I’m knitting when I get in from the gym, before I start work (2 rows while collapsed on couch). I’m knitting after a hurried lunch (4 rows). I’ll be knitting before Pilates this evening, and any other time/place I can until I finish them. The yarn is Cherry Tree Hill ‘Blueberry Hill’, straight from the stash. It feels good, lovely and springy. Much livelier than the Lorna’s Laces which, incidentally, bled pink rather badly when I washed them. I think the springy-ness has something to do with the amount of twist in the yarn; I plan to investigate this when I’ve time. I must think more about spinning — I’ve signed up for a 1-day course with Nancy at Handweaver’s Studio in January. I’ve also assembled a binder of record cards to keep samples of yarn I’ve spun as Knitterguy Ted suggested. My very, very first is in there already 🙂 Now that’s amusing. I don’t have a complete bookmark file in Firefox, which is what I use for Blogger, so I googled ‘knitterguy’ to find Ted’s URL. And found this. Which is, of course, completely true. Just look at his spinning, and his lacework. On the left, beyond the hedges, the brick building with the red roof was once something to do with the school caretaker; the cream (painted brick) building with the ugly, fake slate roof was the school, which was declared ‘unviable’ and closed in (I think) the 1980s. The buildings then became a sort of mini-industrial estate which was sold to a developer when the owner retired. Now the buildings are being re-shaped into houses, and another 6 or more large houses have been built in the yard to the rear. Britain is a small island inhabited by a lot of people, all of whom want to live in their own house (I am intrigued by this, and the possible reasons for it.) Development is restricted by laws protecting scenic or historic landscapes, historic townscapes, and other binding classifications of land. Land adjacent to a village may not be built on unless Planning Permission is granted, and often it’s not. Especially as those who’ve already got their houses usually campaign to prevent further development ‘damaging’ ‘their’ landscape. That means there’s a housing shortage here, which in turn means houses are seriously expensive. People born and raised in villages like this and working in local industry often can’t afford houses in their villages. Of course smaller, cheaper houses could be built, but developers have to be forced to do this as the profits are (of course) smaller. We incomers just add to the problem: demand drives the prices higher and, with two incomes or a London salary, we can afford them where the locals can’t. Yes, I feel guilty. But at least I not only didn’t campaign against this development, I actively argued against the campaigners on the grounds that there are some low-cost homes included. And it’s grossly unfair that those who already have their homes should work so hard to deny homes to others. In the distance, the village church. The stone pillar near the street is the village war memorial. France seems very, very far away. The walls of the chancel (the bit of the church closest to us, with the window) date from the 12th C and most of the rest is 13-14th C. Not unusual in Britain 🙂 It’s largely built of roughly-coursed flint held together with lime mortar. The tower houses a ring of 6 bells, which are rather fine; although the local ringers aren’t, um, brilliant, we do regularly have the pleasure of hearing the bells rung really well by groups from elsewhere. You may be able to see some black plywood figures standing in front of the Chancel; I couldn’t work out what these were until the other night, when I realised their shadows (an angel, and others less identifiable) are projected onto the Chancel by a floodlight. I wish the Church wasn’t lit like that: I’d rather see the stars. Sorry, Debby, no pink or cats yet, but I’ve got to get back to the maps. I’ve done 75 as first drafts and more have just arrived! This entry was posted in Uncategorized on December 13, 2006 by sarahw. I remember when planning permission was granted to allow the demolition of a very old and characterful building at the end of our row of four cottages. The building was almost two hundred years old and (to me), beautiful. They planned to build four detached, bland modern houses, and they did. I felt anger and a sense of grief at losing the old building and the aged barn attached to it, but kept reminding myself that it was indeed necessary, and part of the larger scheme of things. Nice sock yarn – the socks will surely be very appreciated. After all, it’s an emergency situation. Mind you, I had a similar situation back in April and I still haven’t finished the one sock I started then. But you have more staying power (and I was knitting 90 sts). Handknit socks are the ultimate gift, Sarah. You are a very good partner! Several of our friends have struggled with the housing issues in Britain. It sounds so hard to buy a house, and here we are, in the USA, at the same age, on our second. (we sold the first to afford the second. )We too can hear bells from churches in our neighborhood. Alas, the churches aren’t historic, the bells aren’t all that fine, and the bell ringers, well? Oh well. It is nice, on clear evenings, to have a free serenade while I’m in the yard with the dogs though. While we have some light pollution, there are more stars here at night than most places I’ve ever been. All part of the big sky effect… Good luck with your maps! Your husband is a dear to want your handmade socks so much!Thank you for literally giving us a window into your world. 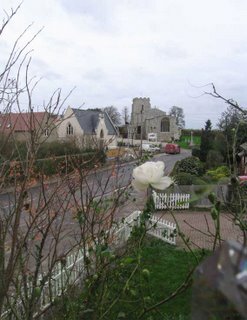 I have always thought living in a village was so pretty and quiet but I can now see there is another side to that too.I live in a very crowded town that seems to get more crowded by the minute; there appear to be no laws to check growth. The traffic is abominable, and the knocking down of modest older homes (and by older I mean 1st half of the 20th C! )to build what we call McMansions on the site is shameful. The commercial stuff goes on unchecked — if they can wedge in one more superstore, they will. And all the buildings are now being built alike, from here to Santa Fe, New Mexico — no regard for local architecture styles when our country has vastly different climates! This is one of the reasons C and I want to move to a quieter town, with stricter rules that have more respect for the landscape. Our neighbors next door built a huge addition to the back of their house that blocks our sunshine, and it is unsightly too. Fingers crossed for a springtime buyer and a more gentle area to live in. Sorry to rant, but that topic really gets me going. On a happier note, your rose looks so brave!! A reminder of the warmer weather to come. It’s interesting to find out that there’s the same drive to build more — and bigger — houses is the same in the US. Debby, I’ll cross my fingers and hope for you, too: the shadow that addition casts can darken your lives as well as the block the sunshine. I find that anything affecting my happiness and security within our yard has an astonishing impact on my enjoyment of life in the house. We invest so much in our homes.